A wonderful musical adapted from the classic Cinderella story with animal characters. Prince Richard–the Rabbit-Hearted, Princess Tabitha of the Blue Mountain Grove; they are the center of this adaptation. It seems that when the Grove burned down years ago, Tabitha’s parents left her on the doorsteps of the Bugmerks, a family of toads on the edge of the Great, Grey Swamp. After the death of Mr. Bugmerk, Emilia and her daughters Merklene and Bogelda made life miserable for our Tabitha. 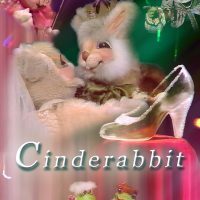 So much so that she remembers none of her past, hence they call her “Cinderabbit.” Life is made bearable for her by her close friend and confidant, Mercedes, a mouse living in the Bugmerk’s dwelling. Well, the night of the Ball comes. The Bugmerks leave poor Cinderabbit behind. And who appears? Gracie–Cinderabbit’s Fairy Pig-Mother, who sends Tabitha off to the ball. Delightful characters and situations populate this colorful retelling of the classic tale. When filmed as a television puppet-musical for PBS by KBYU-TV in Provo, Utah it won a “Best of West” award and an EMMY award. Order from Zion BookWorks for the price of $10.95 (+shipping and Maine sales tax) by clicking on the “Add To Cart” button below. PayPal will process the payment through its Shopping Cart system.